It’s the classic story of someone rummaging around in the dusty family heirlooms and stumbling on a ‘lost,’ valuable artwork. Of course, it always helps if your great-great-grandfather was in the business of painting historic Texas battle scenes — including the two giant works that hang in the Capitol. A ‘lost’ painting by Henry Arthur McArdle was recently rediscovered in a West Virginia attic — in the home of some of McArdle’s descendants. McArdle is the artist who created both Dawn at the Alamo (1905) and The Battle of San Jacinto (1898), the giant murals that hang in the Texas State Capitol in Austin. The 1901 painting — a much smaller, alternate version of The Battle of San Jacinto — will be auctioned at Heritage Auction Galleries in Dallas Nov. 20. The opening bid is $50,000. The painting is expected to sell for more than $100,000. Texas art patron J. T. DeShields commissioned the five-by-seven-foot painting from the Irish-born McArdle, who specialized in epic battle scenes. But McArdle kept the work when DeShields failed to pay him the full price of $400. McArdle died in San Antonio in 1908, and his widow returned to her native West Virginia. The painting was mostly forgotten. 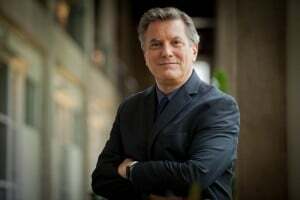 In January this year, Jon Buell, the artist’s great-great-grandson, was visiting the house of his late grandfather, West Virginia banker George Bland, when he came across the painting and asked his grandmother about it. She said it had been in the attic since the ’30s. Buell began contacting Texas art museums without much response — until he called Atlee Phillips, director for Texas art at Heritage, and sent her photographs. 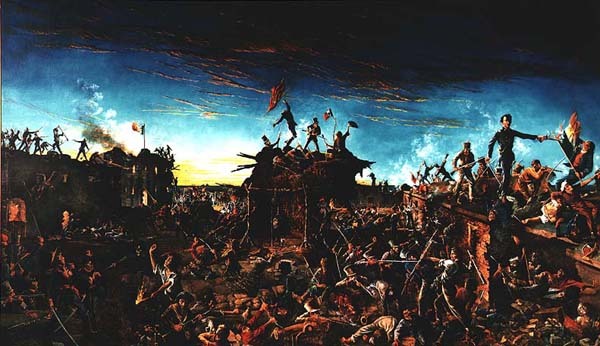 The differences between the two painted treatments of the decisive battle of the Texas Revolution are matters of historical accuracy and condensed composition. The larger version, which hangs in the senate chamber of the Texas State Capitol, is more detailed and has a much wider scope. Because of its limited size, the smaller version aims for a more tightly focused, more classically ‘heroic’ composition. DALLAS, TX – It is considered by the experts to be the most important find in Texas art in the last 100 years. In fact, it may be one of the best American art finds, period, in the last century: H.A. 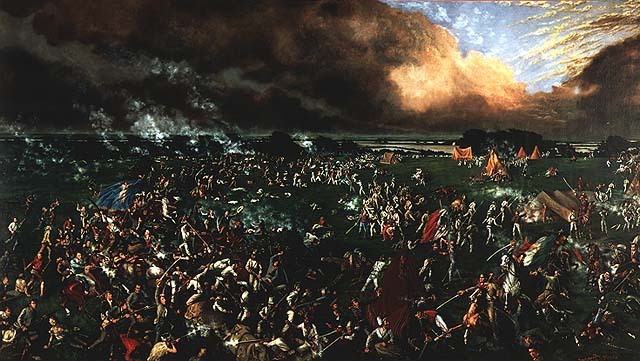 McArdle’s alternate version of The Battle of San Jacinto, painted for one J.T. DeShields in 1901 – some five years after he painted the famous mural of the same name that hangs in the Texas State capitol building – has miraculously emerged, in surprisingly good condition, from the West Virginia attic of Elisabeth Bland, the painter’s great-granddaughter-in-law. The painting will be offered as part of Heritage Auction Galleries Nov. 20 Signature® Art of the American West and Texas Auction, taking place in-person in Dallas, and live online at HA.com. It is expected to bring $100,000+. The photos, however, looked correct. Intrigued, Phillips contacted the family and quickly learned that they were indeed descendants of the great painter. Further research showed that in 1901 J.T. DeShields had commissioned an alternate version of the San Jacinto painting that hangs in the Texas State House. The painting was never paid for and McArdle took it with him when he left Texas shortly thereafter to move to West Virginia with his second wife, where it disappeared – until now. True to form in the best “attic find” stories, McArdle’s descendants had no idea that the painting slowly blackening beneath the dust in their attic was anything of value or of historic import. In fact, it existed only hazily in the recollections of the family. 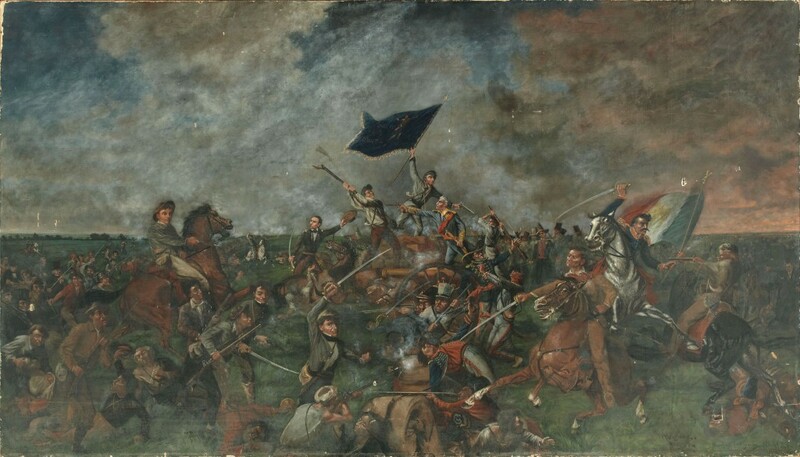 I would like permission to reprint this article in a notebook I am creating for the person who bought this painting (McArdle’s 1901 Battle of San Jacinto). Please contact me at [email protected].